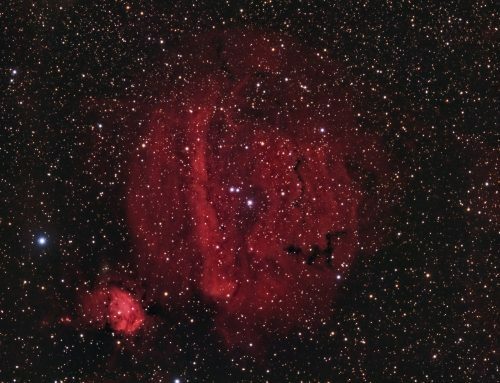 Sh2-132 is one of the 312 bright emission nebulae catalogued by Stewart Sharpless. 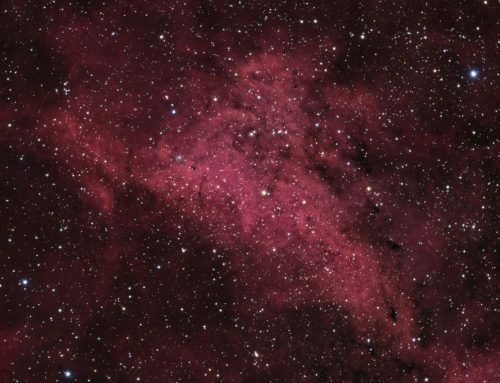 This large area of emission nebula in the constellation Cepheus glows from the characteristic red light of ionized hydrogen. 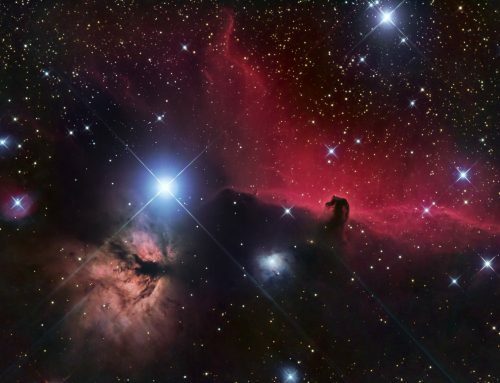 Sh2-132 is about 1,200 light years away. Dark patches within it are due to soot blocking out the light. There are also some prominent dark nebulae blocking out the light of the stars behind them outside the main area of Sh2-132. I imaged this once before, in 2011. 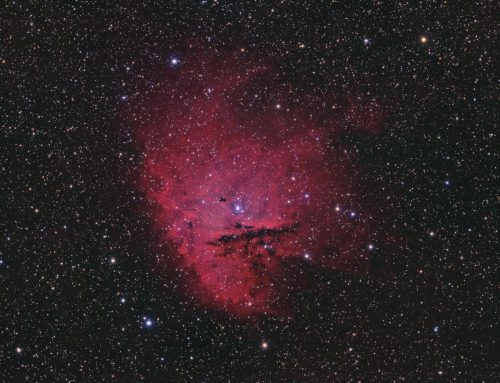 However, my setup at that time could only capture the core, and the processing leaves much to be desired, since it was very early on in my astrophotography adventures. Sky-Watcher Esprit 150 f/7 refractor, QHY 16200-A camera, Optolong Ha, O3, L, R, G and B filters, Paramount MX. Acquisition with TheSkyX unguided. Focused with TheSkyX @Focus3. Automation with CCDCommander. All pre-processing and processing in PixInsight. Acquired from my SkyShed in Guelph. No Moon, average to excellent transparency and fair to above average seeing. Data acquired August 14-16, 2018. 14x10m R, 12x10m G and B, 18x20m Ha (Total = 12hr20m). Creation and cleanup: ChannelCombination was used to make a color image from the R, G and B masters. 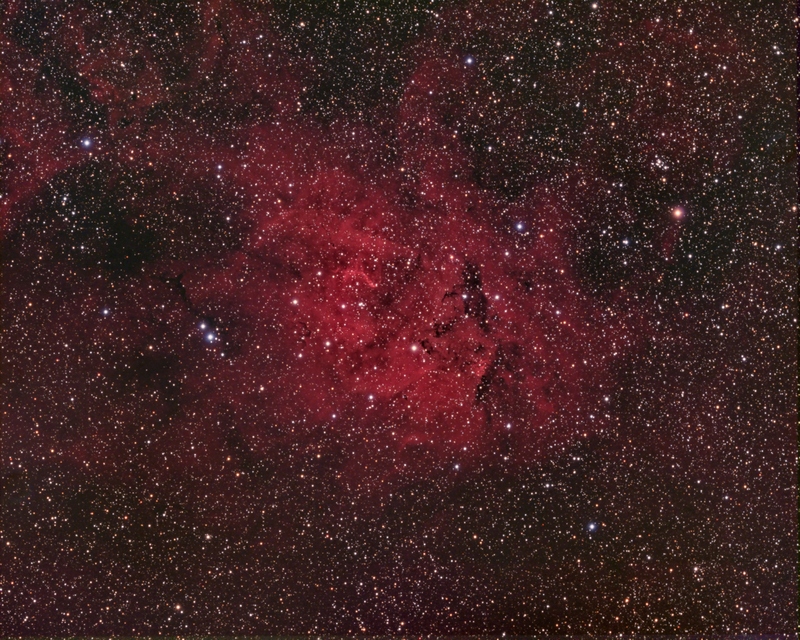 The RGB image was processed with PhotometricColorCalibration using a small preview of background sky as the background reference. Linear Noise Reduction: MultiscaleLinearTransform was used to reduce noise in the RGB image. An internal mask was used, with layer settings for threshold and strength as follows: Layer 1: 3, 0.75 Layer 2: 2, 0.6 Layer 3: 2, 0.5. Deconvolution of Ha: A star mask was used as a Local Deringing Support Image. A copy of the Ha image was stretched to use as a deconvolution mask. Deconvolution was applied (80 iterations, regularized Richardson-Lucy, external PSF made using DynamicPSF tool with about 20 stars). Stretching: HistogramTransformation was applied to the Ha master with background brightness approximately matching the luminance of the RGB image. Combining HaRGB: PixelMath was used to add Ha to the red and blue channels with the following expressions, using a mask to protect stars and ensure smooth transitions. Nonlinear Noise Reduction: TGVDenoise was used in L*a*b* mode to reduce noise in the background areas. Layer settings for threshold and strength: Layer 1: 3.0 0.9 Layer 2: 2.0, 0.75 Layer 3: 1.0, 0.6 Layer 4: 0.5, 0.2. 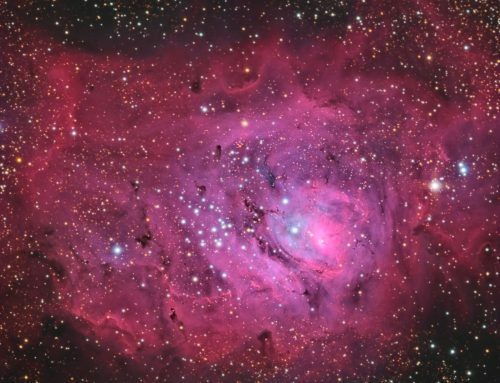 Sharpening: Using a mask to protect stars, background and dim nebulosity, MultiscaleLinearTransform was used to sharpen Layers 2 and 3 (strengths of 0.1 and 0.2 respectively. Contrast Enhancement: LocalHistogramEqualization was applied with a scale of 50 (max contrast 1.5, strength 0.5) and 150 (max contrast 1.5, strength 0.2). ExponentialTransformation was applied to brighten dim nebulosity (Power of Inverted Pixels, strength 0.5). MultiscaleLinearTransform was applied to sharpen layers 2 and 3 (bias of 0.1 and 0.2, respectively). Final Steps: Background, nebula and star brightness, contrast and saturation were adjusted in several iterations using Curves with masks as required. The DarkStructureEnhance script was applied with 8 layers and a strength of 0.3. Star sizes were slightly reduced using MorphologicalTransformation’s Morphological Selection tool (selection 0.15, strength 0.4). Image scale is about 1.15 arcsec per pixel for this camera/telescope combination.